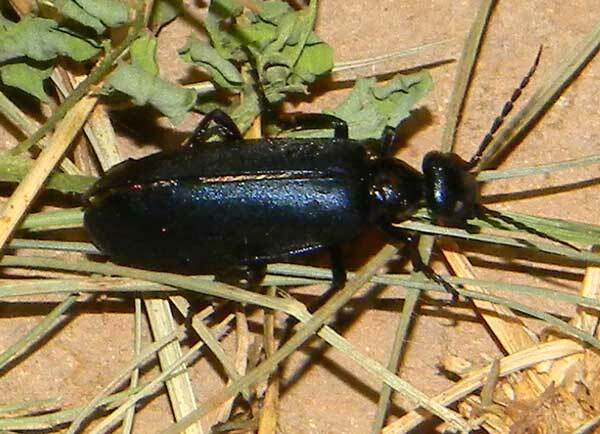 This blister beetle was found at night around lights at a lodge in Amboseli National Park, Kenya, March 2011. Blister Beetles are among the most fascinating of insects. There name derives from the effect of their hemolymph (insect blood) on the skin. Normally this is an effective defense on the part of the beetle. Indeed the conspicuous coloration of many species advertizes this chemical weapon. The immature stage of blister beetles is a parasitic grub that lives in the soil within an egg chamber of a grasshopper or bee, depending on the species. Adult beetles eat flowers or leaves of plants; if abundant the gardener will sometimes take notice. If a horse inadvertantly swallows a blister beetle, the consequence can often be very serious illness or death due to the poisons within the beetle's body. Copyright Michael J. Plagens, page created 25 July 2011.